Where to start?! I wholeheartedly concur with the resonances you have articulated, Jonathan. I am making the provocative claim that Christopher Nolan understands Batman’s actions at the end of the film as an intentional submitting to the scapegoat process outlined above. Such actions place Batman squarely within the vicious cycle of human violence, signaling the ultimate failure of Bruce Wayne’s flawed strategy. Given these two divergent interpretations of Batman, the one casting him as distinct from the violent origins of humanity, the other as fully submerged within its grip, I would like to offer some supporting evidence for my interpretation. To begin, Girard makes clear that the actions of one willingly submissive to the scapegoat mechanism and one unwilling to take part in its violence are virtually indistinguishable. Both easily become scapegoats for a hysterical mob. For the former, as Girard puts it, “the spontaneous act of will is the same as the irresistible hypnotic power of the example” (The Scapegoat, 64). For the latter, the rejection of violence exposes the violent origins of every facet of human life, origins the mob will take great pains in suppressing, even death. By the end of the movie, however, the sun has set on Bruce Wayne’s strategy. Harvey Dent, the representative of Gotham City, has become an agent of chaos himself, leaving justice to the flip of a coin. Batman cannot accept the failure of his strategy. A failure he was prepared to accept just days prior. Only one option remains. The violence and chaos of human social order that the Joker so effortlessly exposed must be covered up. But how? With the hysteria of the city verging on social upheaval only a victim will bring catharsis. Rather than exposing the heart of darkness within Harvey Dent, Bruce Wayne surrenders himself to the inevitable outcome of his terrifying (and everlasting?) 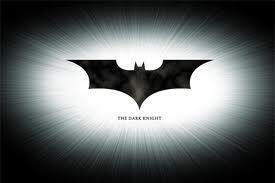 symbol, the Dark Knight. Humans like Bruce Wayne who willingly submit themselves as scapegoats in order to suppress the dark origins of human society inevitably attain a mythical, even quasi-divine status. Such a decision, however, comes at a high cost: their true humanity is willingly sacrificed upon the altar of false humanity. There’s no going back. There is no dawn that follows this dark knight. Delicious theater popcorn for the brain. Your essay, that is. You are an amazingly coherent writer and thinker. I’m inclined to think, as a Christian, that Girard is taking his ideas from the life, death and resurrection story of Jesus (he’d concur I believe). And thus, the Batman story, along with the slightly less well developed Harry Potter modern sensation are retellings of the Christ narrative. Your blog was delicious in drawing the lines, and I’ll be borrowing it in explaining Girard to others! Good show. Did you know a source where I can download that book “I saw Satan fall like lightning by Rene Girard”? thanks in advance. I would add that in _I See Satan Fall …_, Girard makes the point that a functioning judicial system is the institution that fixes the problem. It is precisely the judicial system, of course, that Joker subverts and destroys by the movie’s end. I saw the movie before reading Girard’s book; thanks for making the comparison. Great article, and responses. But I feel that a correction is in order regarding your observation of the ferries. What I love about all of Chris Nolan’s movies (with an assist from his brother Jonah for co-writing this and “The Prestige) is that he only shows us what he wants to show us. What we know about Bruce Wayne/Batman is that he makes flawed decisions sometimes, and we as an audience know this or would say how ourselves how we don’t agree with some things he does, like pancaking cop cars or making irrational decisions like turning himself in, against the advice of his close friends. What Nolan does RE the ferry situation, and why the Joker is right in the end, is that Batman doesn’t know what happened on that boat. Batman says to The Joker that the civilians just showed they are good, but Batman is not entirely correct. And the Joker, deep inside, knows this. Batman doesn’t know that a majority or more of those “sweet and innocent civilians” (as the Joker says sarcastically) voted to blow up the prisoner boat. Just as that one man who stepped up to it froze (and did the right thing by not blowing up that boat), another could have gone thru with it all the way. The Joker, in the end, wins, because he correctly judges humanity as wanting to fight each other off, even the “civilized ones”, if it came down to it. I mean, just look at how each of those civilians responded to the situation when it happened : “We can’t die, those men had their chance!”….ect ect. The boat scene is uncomfortable to watch, because it is all too real. We all know people in real life who would act like that in that situation, but not enough of us would do what that prisoner did, by throwing out the detonator. But that’s humanity…that’s how we are. Batman, though, makes the true heroic sacrifice in the end. Batman, who puts his life on the line everytime he tries to stop a criminal, is more heroic than a Spiderman or a Superman, for that very reason. He’s a flawed man, who makes mistakes, and flawed for not admitting his mistakes at times. But tries to hold true to his one rule, and when faced with the test of time, he makes the ultimate sacrifice to protect all the hard work done to make things right.